Sudhi Seshachala is techno wizard with immense experience as serial technology entrepreneur. Born in Banglore and grown up in a middle class family, this young dynamite is appreciated for creating superlative techno-functional products. Data entry for Government of India was his first startup job experience that he earned while studying in second year engineering. He co-founded & built B2BSphere with Babu Jayaram – his child hood friend who shared similar dream i.e. of developing a product and the idea for next venture got materialized. It was about creating something for suppliers/businesses who fail to generate quality leads in India. 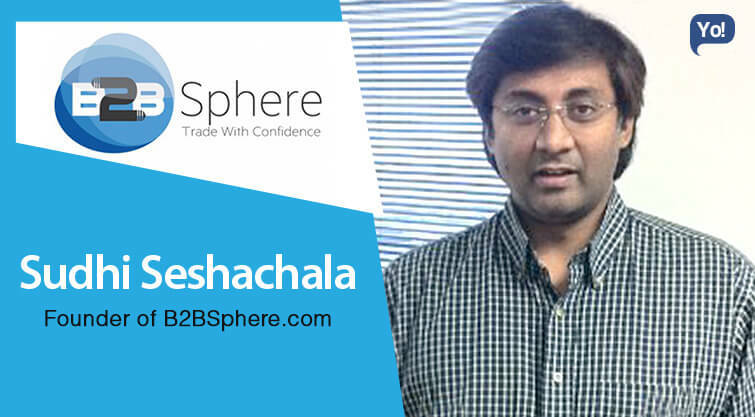 Sudhi Seshachala’s management skills and farsightedness helped him define growth framework and B2Bsphere is reportedly growing 50% every month. His patience combined with knowledge makes him. Read about his strengths and vision ahead. For businesses, B2BSphere offers new generation trade market network empowering improved buyer and supplier discovery and management within a public or private network. Well, While bootstrapping our previous venture, notices some key areas that could be improved within B2B segment. Unfortunately the solutions were all quite old school. Quickly realized a need in B2B and segment is prominent in SME/MSME segment from supplier side and SME and large enterprises on buyer side. Unlike B2C, B2B, we had companies buying and selling products and services, a challenging and perhaps more demanding than B2C segment. 3. Third party Verification services for buyers to verify the authenticity and Quality process is completely absent from the B2B Eco system. 4. Social Networking is the most powerful tool today for sales and marketing. The existing tools just provide avenues to share your profile. Journey so far is quite exciting and exhilarating. But then, we have miles to go and several more un-chartered territories/challenges before we complete our journey. Most challenging so far has been hiring, retaining and constantly motivating the team to be always deliver top quality product consistently. We wanted to first provide product-market fit and willingness for customers to pay for the service. We have proved the business model and quite happy with the progress we have made so far. We are completely bootstrapped till now. Generating revenues from customers. Like any initial stage startup, we have had our own set of challenges of hiring and retaining great talent. We have adopted some unique and attractive ways to hiring and retaining talent. We train fresher’s with acceptable academics and then absorb them into the company. This has worked out well so far. Though some of them might decide to go separate path – the ‘Train to Hire’ model has worked well for us. Attitude, Talent & perseverance are qualities an individual must have to achieve success. Google Apps, Zoho services, B2BSphere home grown tools are quite popular for us. Startups are quite stressful. It is quite important to have a work-life balance as much. Enrolling into a gym is good and perhaps if affordable, even have a personal trainer to help you with gym. It helps to ponder over, relax and be fresh mentally physically to address day’s challenges. Attitude and not talent towards life will define success. Repeating a mistake should be avoided at all costs. Don’t over analyze – Just go with gut, trust instincts and work from there. Make B2BSphere a global brand with 300,000 businesses around the world. Instead of joining a company, would start a company. Lake Tahoe, Paris & Mysore.